How are we doing? Anyone in the mood for Jello? Err….I mean vintage Jello mold ornaments? So how to do you turn these guys into ornaments? Super duper simple! I know, I use that word a lot around here but this one is a no brainier. Really. All you need is ribbon, baker’s twine, and hot glue. Make a loop with the baker’s twine and hot glue the knot to the top of the mold (back side). On the front hot glue a ribbon bow to hide where you just hot glued the knot. That is all! Ok, wait won’t be fair if I don’t reveal a blogger fail moment. Actually an almost blogger fail moment. My original plan was to drill a small a hole in the mold and string the loop through that. After giving it a bit more thought realized that it would be a bad idea, a pretty bad one at that. Drilling a hole in the mold would basically render it useless for anything in the future. Note, I mentioned anything not just Jello making. 😉 I already did another project with them. You know me, always trying to get the most bang for my buck. I’m really glad that I decided to leave the molds alone and to go with the hot glue. Wish I had so many of them to decorate my entire tree with! If you missed the first 7 days here’s the list of my 2014 handmade Christmas ornaments; Santa Belt Ornament, Sunburst Mirror Ornament, Glitter Swirl Ornament, Terrarium Ornament, Cork Ball Ornament, Woodland Reindeer Ornament, and Marbles Ornament. 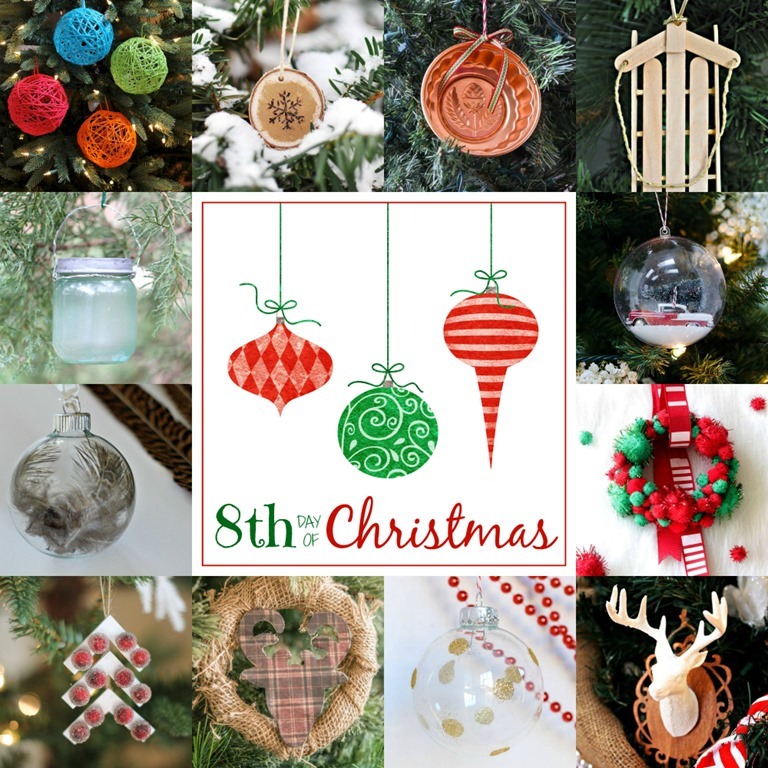 Have you seen the other 12 Days of Christmas projects for Day 8? Pretty neat stuff, huh? Way to think outside the box. Cute idea! But I have some pinning to do (of your amazing Jello mold ornament!) and ornament posts to visit! Love these little molds! What a great idea to turn them into ornaments.